The safe and reliable KingAir B200 turboprop. Sporty’s ReadyFlite Fractional Aircraft Ownership Program provides hassle-free, convenient, and safe air travel solutions to individuals, families, and businesses, in the comfortable and spacious environment of a Beechcraft King Air B200 aircraft. Sporty’s Fractional Aircraft Ownership Program will offer five, 20%-equity ownership stakes in a professionally-managed, turnkey system to deliver each owner an unparalleled private aviation experience for up to 100 flying hours or 65 days annually. Fractional ownership provides all the advantages of owning your own aircraft without the hassle of whole-aircraft ownership. You simply gain the convenience and freedom of owning your own aircraft, for a fraction of the cost, by sharing those costs with like-minded individuals. Owners can rely on Sporty’s expert management team and extensive experience for acquisition, maintenance and operation. Sporty’s will provide pilot services, scheduling, and maintenance, as well as those special touches like catering, ground transportation or any other special requests during your travel. One-time acquisition fee – $400,000 per share (resalable). Monthly management fee – $2,500 – includes indirect operating costs such as pilot training hangar use, insurance, maintenance, cleaning and support services. Hourly operating fee – $1,050 – covers direct operating costs such as fuel and oil as well as engine accruals and incidentals. You are billed as you fly. 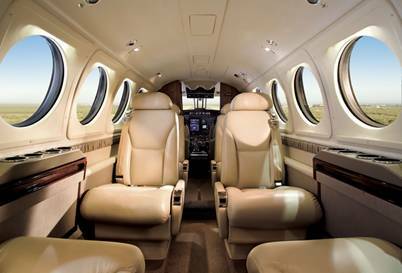 The KingAir features a spacious and comfortable cabin. The King Air B200 is a pressurized, twin-engine, turboprop business aircraft. Standard configuration of the King Air is for eight passengers, with on-board lavatory and large baggage area accessible from the cabin. The spacious and quiet cabin is ideal for work or rest. 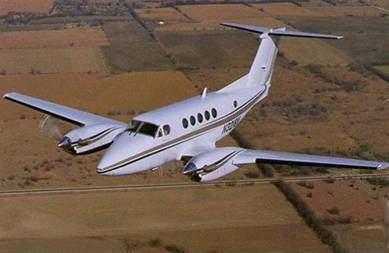 The King Air travels at nearly 300 mph with a range of more than 1,000 miles. The versatile King Air provides outstanding value and amenities that are sure to please even the most discriminating travelers. For more information or a personal consultation, please call 513-735-9100 ext. 239 or email ReadyFlite@sportys.com. Copyright © 2019 Sporty's Academy.